Townsend Close, as its name suggests, was at the eastern end of the town and was shown on Watts' maps of both 1806 and 1831 as a triangular field at the junction of Reckleford Hill and London Road, now the junction of Reckleford and Sherborne Road. 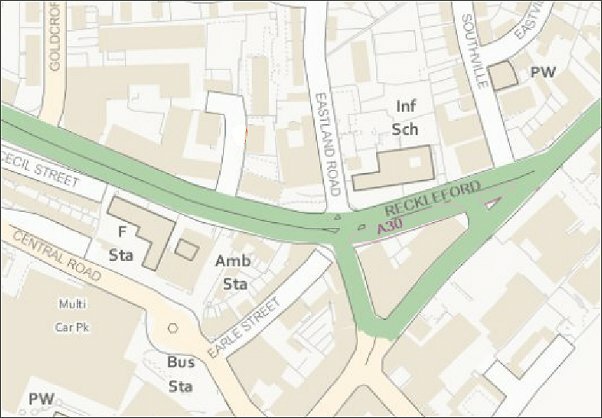 By comparing the two maps below, the 1831 map and the modern Ordnance Survey, it wall be seen that the area occupied by Townsend Close is the area bounded today by Reckleford, Sherborne Road and Wyndham Street. The eastern end of this triangular piece of land was the extent of the borough of Yeovil as defined by the 1830 boundary extension. On Watts' 1806 map the ownership of the plot was attributed to Mr P Francis. It was named as Townsend Close in the 1841 census and three families were listed in the census as living there. In 1916, while excavating for a road widening project, workmen unearthed the much-damaged head of a wayside cross here. 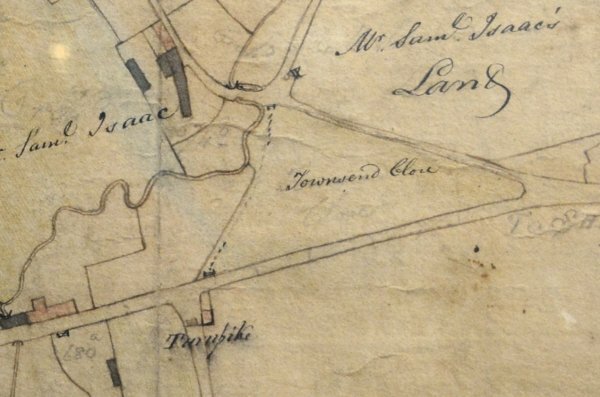 E Watt's map of 1806 shows the field called Townsend Close at the junction of Reckleford Hill and London Road - now Reckleford and Sherborne Road. At this time the field was owned by Mr P Francis. In the top left quadrant, the dark-shaded building is the farmhouse of Samuel Isaac and surrounded by his land. The farmhouse later became the Glovers Arms. Note the dotted line representing a footpath running along the western boundary of Townsend Close, with a gate at either end. This footpath is the line of the later Wyndham Street. 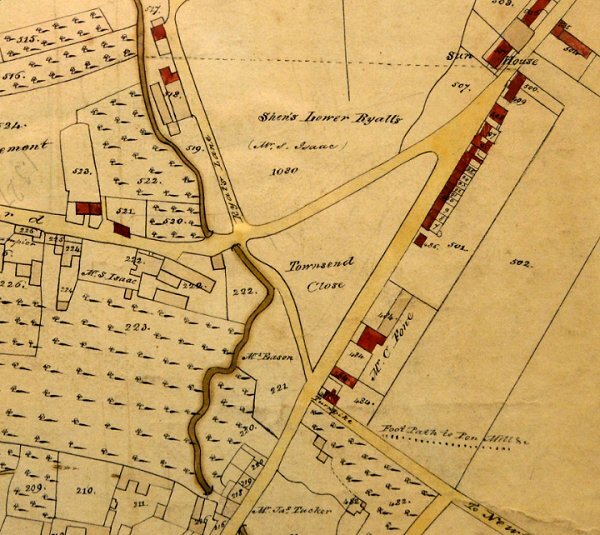 Showing the same area as above, Watt's map of 1831 shows Townsend Close unaltered although Wyndham Street has been newly-built and houses have been built along the southeastern side of London Road. The modern Ordnance Survey map showing much the same area as seen in the 1806 map above, showing the area occupied by Townsend Close to be the area bounded today by Reckleford, Sherborne Road and Wyndham Street.